Photoshop Elements has features that can speed up the editing process for those wanting to stay away from the complications of its big sister. One of these features is the one-click Fx. 1. With your image open in Photoshop Elements choose the Quick mode. 2. In the bottom right new options appear, click the Fx. This reveals a new panel with all manner of one click goodies. Some of these will work better than others depending on your image. 4. Again, more options are revealed each giving a representation of what the filter will do. For snow, click the bottom right icon of the four. Immediately the effect is added to your image. If youre not happy with it, click the Undo button at the top of the panel or click another filter to replace it. 5. For many images this may be all you want to do, but lets look a little further. Click the Expert tab at the top of the image. This used to say Normal and should, I think, still be called it. 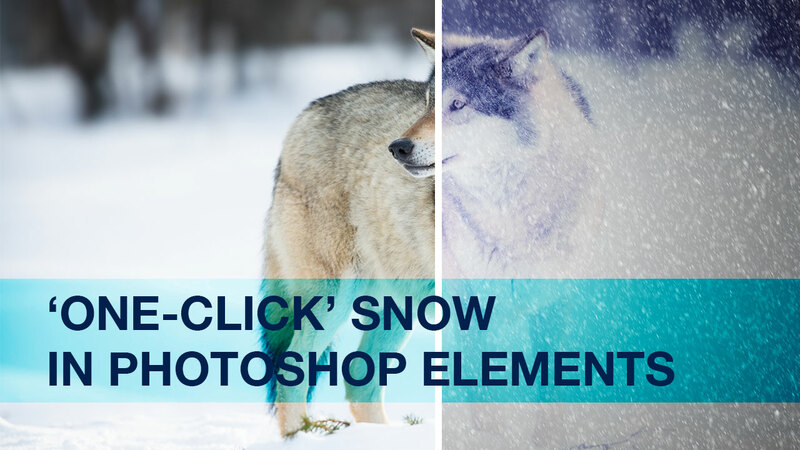 Those familiar with Photoshop and Blending Modes may be surprised to see that the snow has been added with a Blending mode, flattened and then have a Blending Mode of Normal applied to it. 6. You can reduce the Opacity of this layer, change the Blending Mode and paint it away using the attached mask. Is there any part of photo shop that is free that is any good? Photoshop is not a free app. There is much within Photoshop Elements that produces results equal, if not better, than in Lightroom. Yes I know – I have made an evil statement that is that of a heretic.. But this is true if the user is willing to learn and not insist on instant results. Another evil statement: The use of PSE to produce equal or better results forces the user to understand what is being done in terms of the fundamentals. And then there is also the advantages of layers and their intertwining. But – I am an old man who relishes simple things with which the complex can be achieved, things that take patience. My reward is results based on my efforts and not necessarily that of built-in quickies. Lightroom and Photoshop serve different purposes. Don’t think of them as the same tool. The following is not meant to be argumentative, to initiate a diatribe, or anything of the kind. There is nothing wrong with their decision or the reason(s) for their decision. I simply said I thought PSE can provide equal or better results. I added that I believe PSE (and PS) causes one to have to understand the underlying aspects of what they are trying to do more so than does Lightroom. Whether Lightroom or PSE I suspect rests much on familiarity and comfort that drives opinion. Hi Lauri, I’m using Photoshop Elements 13 for this post. New filters have been added in each update, this was new in 13 if memory serves me right.